Fortune Cookie - What is Fortune Cookie? This site is about fortune cookie quotes. But, what is fortune cookie? Well, here is the summirized version of Wikipedia's description of fortune cookie. 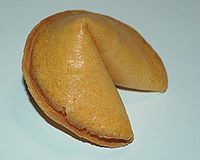 A fortune cookie is a crisp Asian American cookie usually made from flour, sugar, vanilla, and oil with a "fortune" wrapped inside. A "fortune" is a piece of paper with words of faux wisdom or a vague prophecy. It is usually served with Chinese food in Chinese restaurants as a dessert. The message inside may also include a list of lucky numbers (used by some as lottery numbers), a Chinese phrase with translation and sometimes 3 digits daily numbers (also known as Pick 3). The exact provenance of fortune cookies is unclear, but various immigrant groups in California claim to have popularized them in the early 20th century, basing their recipe on a traditional Japanese cracker. The cookies are mostly unknown in mainland China or Taiwan. Now, this site is about fortune cookie messages, so the question is who is writing all the cool and thoughful quotes? If someone has an answer for this, please let me know so I can add the answer here. Or I'll assume big foot is writing all these messages, lol.